AT A GLANCE - The third ranked Yellowjackets also made it through the regular season unbeaten and are coming off two straight shutouts over Malvern and J.A. Fair. 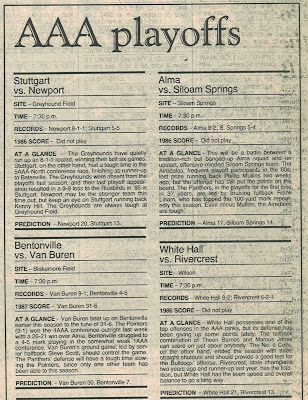 Sheridan's ground game continues to rack up the yards behind the running of Gary Brown and David Damron. Trumann, after dropping four straight games in midseason, came on strong and won its final three, including a big 34-0 victory over Marion. The Yellowjackets' relentless running attack will eventually wear down most teams. 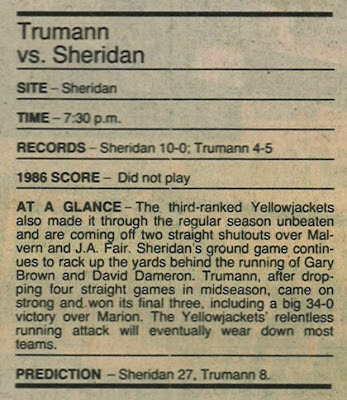 PREDICTION - Sheridan 27, Trumann 8. 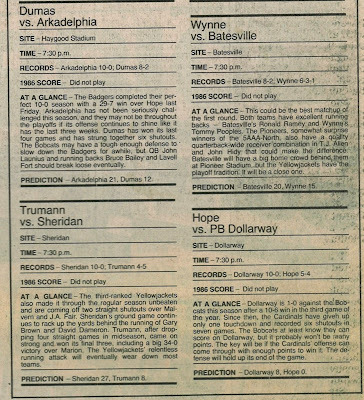 Does anyone remember the actual score? Scroll to the bottom of this post for the answer.